Pollen is essentially the male gametes used for sexual reproduction in plants. It is a fine grain powder produced in abundance by anthers, the male reproductive organs. Pollen is perhaps best known for stimulating allergetic responses in genetically predisposed people. The source of the allergin is a protein inside the pollen grains. The pollens that are most often allergins come from wind-pollinated plants, such as trees and grasses. 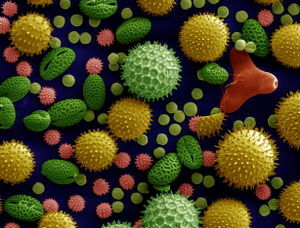 Each pollen grain contains one or two male gametes and a vegetative cell. The cells are surrounded by a cell wall made of cellulose and a reinforced outer wall made of sporopollenin pictured at right. Pollination happens when the pollen comes in contact with the stigma of the same or a different flower. Pollen transport is accomplished by either drifting in the wind or being carried to another flower by insects, such as bees. After pollination the pollen grain germinates, then begin to grow a pollen tube down the style, through the wall of the ovary and into an ovule (incipient seed). As the pollen tube grows, two sperm are produced - one unites with female gamete, the other unites with the central cell of the ovule and produces the endosperm of the seed. Immature pollen grains called microspores have significant biotechnological implications. Ipomea purpurea (Heavenly blue morning glory). This page was last modified on 21 December 2010, at 16:22.